Worf is bothered by some religious angst and is released by Captain Picard to go on an existential quest to find his faith. He goes to Boreth, a place where Klingons often have experiences of Kahless, their mythic warrior-figure. After some disappointing times, Kahless appears to Worf, but it turns out he is more than a vision–he is real! He claims the rights due to Kahless as the returned demigod/deity of the Klingons, but some–including Worf–are skeptical. After Gowron, the current head of the Klingon Empire, issues a challenge which Kahless passes, the stakes are raised even higher. However, Gowron later defeats Kahless in combat, undermining the notion of Kahless being the greatest warrior of all time. It turns out Kahless is, in fact, a clone that was given many of the memories of the true Kahless. The threat of civil war looms because Kahless has already attracted a large following. To avert this, Worf calls Gowron to make Kahless the kind of moral leader over the Klingons while Gowron retains civil authority. Gowron and Kahless agree. Worf is left wondering whether his faith in Kahless was misplaced or whether it could remain genuine. I pretty much loved this episode. If you’ve been following my reviews, you’ll know I’m a sucker for Worf episodes and Data episodes. This is clearly a Worf episode, but there are some great discussions about the nature of faith and belief with Data sprinkled in. The plot is quite strong–there’s a sense of mystery surrounding Kahless. As the viewer, you are almost expected to be skeptical, but you are taken on a ride of evidence right alongside Worf–one which involves eventually believing Kahless might be vindicated as the real deal. Only, it turns out Kahless is a clone. What does that do to the faith Worf and others placed in Kahless? The question is left pretty much open-ended. Kahless goes on to be the moral compass of the Klingon people–something that is an intriguing look into the needs of the Klingon Empire. Kahless himself notes that they are floundering in need of the realization that to be Klingon is to go beyond mere fighting for fighting’s sake. There is honor involved–joy, even. It’s a fascinating insight into Klingon culture that we’ve been developing quite a bit throughout TNG. I love it. Overall, this is a super-solid episode. I forgot to mention the scenery paintings were really neat too. I liked every set as well. Just awesome. The Enterprise is trying to recover some data from a lost outpost. Riker leads an away team down and, well, there’s another Riker there! Turns out the transporter fluke that got Riker out 8 years ago actually managed to copy him and leave one copy on the planet’s surface… alone… for 8 years. 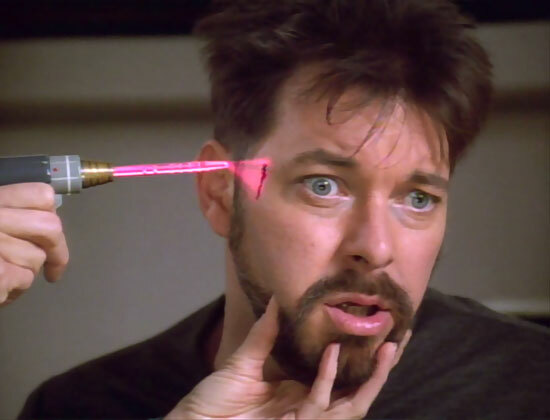 Riker 2 [the double, Thomas Riker] tries to integrate with the crew while Riker 1 continues to try to operate as normal. Ultimately, Riker 2 rekindles his relationship with Troi, but has to leave to go elsewhere to continue his Starfleet career. Surprise! We have two Rikers! But only for one episode… for now (eerie music). Google it if you’re curious, but you’ll spoil the fun like I did. Anyway, I quite enjoyed this episode. There are a lot of moments for pondering “what ifs” here that are worth thinking about. 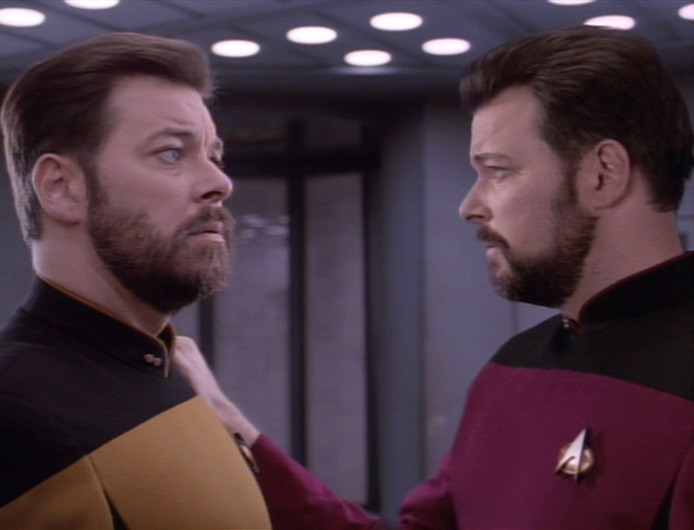 Most importantly: What if William Riker wasn’t so dumb about Troi and they just got back together! Come on!? Thomas Riker should have killed Will Riker and replaced him. Apparently that’s what the writers thought too. The Star Trek: The Next Generation 365 book (which is excellent and should be required reading for TNG fans) told me so. Apparently, even Marina Sirtis (Deanna Troi) thought that’s how the plot should have gone, to allow for a continued romance between, well, Riker and Troi. Alas, instead we have to deal with the continued, constant sexual tension between the two until Star Trek Nemesis, but that’s a different story. Anyway, another what if is whether you would make the same choices twice. Obviously this isn’t the exact same scenario for each Riker, but Thomas has a kind of fresh chance to repeat the same path William took–or not. It’s an intriguing look at free will and how character can help determine the choices people make. An enjoyable episode that is really just dragged down a little by some of the same suspension-of-disbelief problems and lots of continuity difficulty. I mean if they can do things like this with a transporter, how would they let anyone stay dead? Oh well. It’s TV, not real life. Riker is having a rough day. The episode opens with Riker apparently in an insane asylum, being told that he needs more treatment because he apparently hurt someone. Turns out he is just practicing for an upcoming play on board the Enterprise. However, he wakes up later and it appears he is actually in an asylum that looks exactly like the set back on the Enterprise. As he tries to figure out what is going on, he continually shifts back and forth between the Enterprise and the asylum, trying to piece together what is real. He becomes convinced that the asylum is real, but then is apparently rescued by Dr. Crusher and Worf. Even this reality breaks down under investigation, time and again, until he finally awakens in the middle of some kind of brain surgery and manages to signal the Enterprise to rescue him. This one is like an episode of “The Twilight Zone.” It’s all over, with layer after layer of reality being peeled away throughout the episode until it is difficult to keep up. But it is never overwhelming, nor does it ever falter. “Frame of Mind” is a truly intense episode throughout. There doesn’t seem to be a lot to actually comment on here, because the greatness of this episode is found in the suspense it carries through, not in any kind of depth of plot or characters. Riker, however, carries this episode quite well. It is not difficult to imagine become disillusioned with one’s own reality under the kinds of pressure that are shown being applied to his mental life in this episode. So…. yeah not a lot to say but this is great viewing. Dr. Crusher talks with Guinan about her attempts to facilitate scientific discussion between a Ferengi scientist who has attempted to develop shield technology to allow travel much closer to stars than ever before possible. However, in the process one scientist apparently dies in a test flight, and the Ferengi turns up dead himself, apparently in a suicide. Crusher attempts to further her investigation, but is thwarted at every turn, including by a direct order not to perform an autopsy. Guinan convinces Crusher to keep up the investigation, which leads to Crusher commandeering a shuttle to see if the Ferengi’s theory works. It does, but the scientist who apparently died in the test flight isn’t dead… and attempts to kill Crusher, who takes him down and manages to return to the Enterprise. The narrative that Dr. Crusher gives to Guinan as she describes her efforts as a scientific diplomat makes this episode have a little bit of a noir feel, and I love that. The plot itself is pretty strong, too, as we have not just the mystery of whether a specific invention might be viable to deal with but also a possible murder mystery. It was fun seeing the plot develop and keep getting more and more interesting. I for sure thought that the Vulcan and/or her husband were responsible for the Ferengi’s death, so it managed to throw me off the scent despite having seen the episode before (hey, it was a long time ago, so I didn’t remember, okay?). The pulpy feel along with the complexity of the actual mystery are paid off pretty well with an ending that doesn’t feel too contrived. It’s just a really solid episode with some excellent work by Dr. Crusher. Plus she gets to roundhouse kick an alien in the face. How epic was that? All of the positive feelings aside, there are some problems with this one. For one, how the heck does the apparently dead alien scientist manage to keep leaving the morgue without anyone noticing he’s walking around on board the ship? 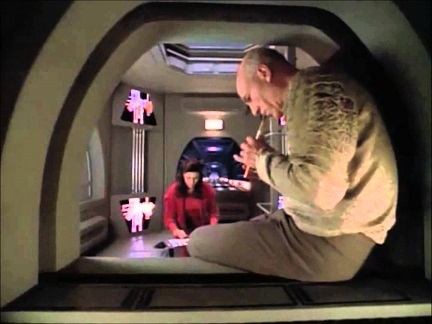 For another, if the Enterprise constantly monitors people’s condition and where they are on the ship, why have they still not integrated some sort of security system into that? Why doesn’t Crusher have more severe consequences (like getting thrown in the brig) for her clear disobedience and insubordination at points? Ultimately, my answer to these questions was “Who cares?” because the episode was too fun to let myself get bogged down with these concerns about plausibility. I’ve been reading through the Star Trek TNG 365 book, which is excellent, by the way, and apparently the authors and the writers of the episode itself thought this one wasn’t very good. Well, you can probably tell from my comments–and our grades below–that we loved it. I love everything about this picture, except that I couldn’t find a better quality version of it. There is a new transfer aboard the Enterprise shaking up the science departments, Lieutenant Commander Nella Daren. When Picard confronts her, he figures out she is up to the challenge, and a skilled, intriguing woman as well. He starts to interact with her more and more, discovering that she is more interesting than he had imagined. It quickly becomes apparent that Picard and Daren are falling in love, and it is a poorly kept secret on board the ship, causing some tension. Meanwhile, they are preparing to attempt a rescue mission on a planet with raging firestorms. Lieutenant Commander Daren is assigned to one of the teams, and initially it seems she was lost on the mission, causing Picard much grief. She turns up alive, however, but Picard realizes he can’t be on board the Enterprise with someone he cares so much about. They decide to part ways, hoping to find each other again in the future. “Lessons” as an episode that does exceptionally well introducing a new character (Lieutenant Commander Nella Daren), building up her story, and having her make an impact on a main character in a noticeable way. It helps, of course, that they chose Captain Picard as the character to fall for Daren. Riker would have been too predictable, but to see Picard fall for her was unusual enough to be intriguing. Not only that, but the way she clearly complemented Picard so well made us root for the relationship as the audience. Another major plus is that Patrick Stewart acts so well! The hesitancy with which he approaches the relationship, the embarassment he clearly displays when he realizes pretty much the whole ship knows, and his interactions with Riker about Daren are all portrayed exactly as we might expect from Picard. The side story of the rescue mission is clearly just an add-on to make drama with Daren go down, but I didn’t mind it because it made sense for the plot: what would Picard do if he had someone he loved–really loved–on board? The decision to part ways was painful, though expected. As a viewer, you know that it can’t possibly continue–they’re not just going to add a main character midway through the 6th season–but it still made me feel badly for them. Also, the firestorm had some cool special effects and problem solving. Often, when something like that is just added on to make drama, the set isn’t that interesting or it might just occur entirely off-camera. This time, they really made their money’s worth on it. Professor Richard Galen shows up on the Enterprise with a marvelous archaeological gift for Picard. He wants Picard to join him on a quest to finish his life’s work, but he is very secretive about it. When Picard turns him down, he leaves to do it on his own but his ship is attacked and destroyed by an information dealer. Picard is determined to track down the reasons behind what his old professor was doing and chases the information trail around the quadrant. It turns out he’s not the only one looking into it, however, as there are also Cardassians and Klingons searching for the same finds. Ultimately, they manage to trace the information back to one planet, where they are trapped by Romulans. In the ensuing confrontation, Picard and Dr. Crusher unwrap the last layer of the mystery, which turns out to be that an alien race long ago seeded the various worlds in this galaxy for life like their own. Hence the reason all the aliens look alike. The people exploring the region leave, largely disgusted, but the Romulan commander reaches out to Picard in hope for eventual reconciliation. The opening of this episode set the stage to be completely awesome, and it stored up enough good will for me to overlook some of the insanity that followed. I absolutely love when Picard gets all geeked out over archaeology stuff, probably because I also get nerd excitement from it. The opening with a description of how the artifact Galen gifted to Picard was just perfect, and it revealed enough mystery for me to want to know more. The overall plot wasn’t bad either. Having the ultimate reveal be that some alien seeded life all over to look like themselves was kind of neat, and it retroactively explains why so many advanced aliens in the Star Trek universe look alike. I wonder if it ever gets referenced again. What was difficult to accept was the insane amount of hand-waving over details throughout. How did all of these other peoples manage to have chunks of information that was relevant to the main quest? Scientific discoveries of their own? Well, the episode hints that they bought the information, but how did they get it so quickly and how did they break the code without the intimate knowledge of genetics that Dr. Crusher brought to the table? It just didn’t make a lot of sense. Moreover, when would Picard suddenly allow a Cardassian diplomatic access to his ship and then cart her around to help solve the mystery? Did he forget he was just tortured by the Cardassians not too long ago? Or did he also forget that they’re basically enemies? Why were the Klingons so hostile? The reason given was they wanted the “weapon” coming from the research, but that’s not really how alliances work, is it? There was a lot of silliness and craziness in this episode, but it mostly seemed to work. 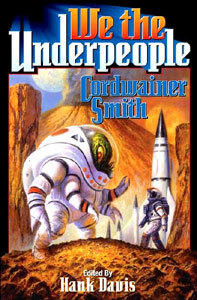 I didn’t mind it all that much, because the mystery was exciting enough to keep me interested throughout. “The Chase” is one of those episodes that I feel like I enjoyed probably more than I should have given its quality. But why apologize for liking something more? I won’t! See the grade!